Hotel Jyonar Palace welcomes you to a world of luscious greenery and snow splashed mountains. It is conveniently situated in the lap of nature close to the market. Hotel Jyonar Palace is keyed to be ever prepared to serve its guests with fully functional facilities, gourmet cuisine and sincere services. The percentage of our guests is increasing day by day as we are serving our guests with quality. 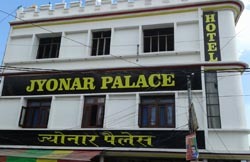 Hotel Jyonar Palace is one of the finest hotels in Pithoragarh, India. With comfortable and elegant rooms with enchanting hospitality this budget hotel in Pithoragarh is a preferred choice for every guest who comes to the hill station .